This is the second time I’ve read this – the first time was in 1975 or so and, being 20-something at the time, I loved it – this is one of a handful of books which had a profound effect my life. When my home (and all it’s contents) burned to the ground this was one of the books I actually replaced. But I never reread it – not in all these 40 years – mainly because I was scared I wouldn’t like it as well a second time. Now a reading group has chosen to read it – this is the second time it’s been chosen by one of my reading groups, but last time I really couldn’t reread it – fear it wouldn’t hold up. This time I’ll give it a try. So the version I’m reading and listening to now is the 25th anniversary edition (15 years ago) which has an Introduction by Pirsig to clarify a couple points, “errors,” he calls them, in the original. Okay fine -I don’t remember either point to know the difference. Into the book itself; the first person narrator and son, Chris along with a couple of adult friends are on a long distance motorcycle trip across the upper midwest, Minnesota through Montana and on down to San Francisco. Somewhere in the first chapters I’m already irritated – this is not the same Becky who read the book the first time. It’s like I’m seeing through some rather lame straw-man arguments relegating science to Buddhist type faith and so on. Then he gets into some ideas which seem rather sexist and racist today. But where do those serendipitous ideas/solutions come from? What is creativity and what is quality? And then when he actually tries to put his ideas into practice of teaching (re the book) he uses this the old take-it-apart approach with the motorcycle and the craft of writing. It’s one thing to recognize quality workmanship, it’s quite another to teach it. – Teaching virtually anything from writing a “quality paper” to overhauling a motorcycle and making a good pie crust needs a vocabulary, take-apart, step-by-step approach – at least that’s been my experience. That’s what those college kids were there to do – and Pirsig gets stuck on part one – “what is a “quality” paper?” – and never moves on to how to actually write a “quality” paper. That said, Pirsig himself writes nicely and the motorcycle trip across the plains is fairly interesting. what with the tension between the characters due to the differences in ideas and oncoming insanity. Also, the idea that Pirsig keeps arguing with himself – or Phaedrus’ ghost – is rather clever literarily – (Crime and Punishment?) I can’t say as I’m disappointed because as literature it does hold up – it’s just that as philosophy – well, I think I’ve matured or this is a different era or something. 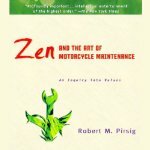 About 2/3rds of the way through the book suddenly took off for me – Pirsig really did a good job with building tension in both threads, the Phaedrus part and the motorcycle trip part. In spite of the Author’s Note, I still thought the ending a bit “Hollywood-ish” but something had to give, one way or the other – the story had to end.